Sweden’s Melodic Death Metal band GORMATHON will release their new album, Following The Beast October 7th in North America via Napalm Records. GORMATHON are a charge of Melodic Death Metal! No, not just Melodic Death, but influences of modern heavy metal with thrash elements and takes inspiration from old metal heroes of the eighties. Today the band premieres their new video for their song “Remember”. Check out the exclusive premiere of the video HERE courtesy of Metal Injection. An album preview clip is available now on the Napalm Records YouTube channel. The video features samples from each song on Following The Beast. Check it out HERE. The album is available for pre-order on Amazon. If you are lucky enough to live in Stockholm you can see the band live at their release show on September 17th. A full European Tour will be announced soon! Savannah, Georgia’s BLACK TUSK have entered the studio to begin work on the follow-up to their last release 2013’s Tend No Wounds EP. The band is currently holed up in Portland, OR at Audiosiege Studios with Toxic Holocaust front man and acclaimed producer Joel Grind. They are currently shooting for a release in the first half of 2014 via Relapse Records. BLACK TUSK‘s latest release Tend No Wounds is available in CD, Vinyl and digital formats and can be ordered from the Relapse Records Store HERE. The EP can be purchased on iTunes HERE. The EP is streaming in full on BLACKTUSK‘s Bandcamp Page. BLACK TUSK‘s video for the song “Truth Untold” directed by Brad Kremer and produced by Tytan Creates. It can be viewed HERE. GWAR, the most brutal band in existence, has bolstered its ranks leading up to the GWAR Eternal Tour. The Berserker Blóthar and Vulvatron are the latest intergalactic warriors to be banished to the pathetic mudball known as Planet Earth. Blóthar; a fat, filthy, frozen space viking, will take over as GWAR‘s lead vocalist. The role of the red-hot cybernetic spitfire known as Vulvatron is more mysterious…Both will feature prominently in the anticipated GWAR Eternal Tour – which promises to be the most shocking and entertaining rock show of the year! Get to know your new masters before they grind you to a bloody pulp! Norwegian black metal tyrants 1349 have premiered their new video for “Slaves” here. “Slaves” is the lead track from the bands forthcoming new album ‘Massive Cauldron of Chaos’. ‘Massive Cauldron of Chaos’ will be released in North America on September 30, and will be available across multiple CD, vinyl, and cassette formats. Pre-orders are available here. 1349 (Ravn -Vocals, Frost [SATYRICON] – Drums, Seidemann – Bass, Archaon – Guitars) also recently announced the ‘Chaos Raids’ European headline tour. 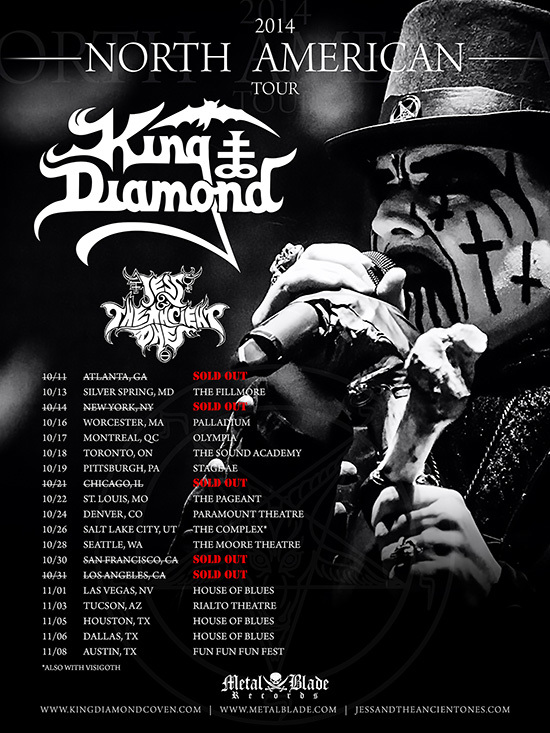 A full listing of confirmed 1349 tour dates can be found below. 1349 are streaming three additional songs from the forthcoming album: “Exorcism“, “Cauldron“, and “Slaves“. “Slaves” is available for stream and purchase at iTunes and Bandcamp. Founded in Norway in 1997, 1349 have remained a constant influence on the Norwegian black metal scene. With a penchant for lightning speed riffing, blazing drums, and apocalyptic lyrics, the band has trail-blazed the underground, surpassing many of their peers through brute musical force. Following a a trio of landmark albums, namely 2003’s Liberation, 2004’s Beyond the Apocalypse, and 2005’s Hellfire, 1349 is set to re-establish their dominance in the world-wide extreme metal scene. 1349 are currently available for interviews upon request. To speak with the band, please contact Enrique Sagarnaga via email or telephone (215-625-8400). 1349 updates will be made available through the Season of Mist website, and the 1349 website and Facebook page. It’s a solid slab of power metal. If you were looking for a time to get back into DragonForce, this may be it. Frontman Marc Hudson’s awe-inspiring voice is given plenty of room to soar, while the music incorporates riffs and tones from thrash and death metal, giving the songs a heaviness never present before. The band’s lyric video for the song “Home” can be viewed HERE. In addition the video for the song “Web of Lies” can be viewed HERE. HALCYON WAY‘s sound cannot be neatly slotted into any sub-category of metal; but it can be described as heavy, catchy, technical, and above all, focused on mature song craft. The band draws influences & inspiration from many metal bands from Megadeth to Dream Theater, Testament or Chimaira. The focus of the songwriting is on catchy hooks, vocal harmonies à la King’s X or Stryper, and on heavy, technical, but ultimately accessible instrumentation. Independent Artist/Producer Celldweller has released the title track “End of an Empire” for his upcoming new album. Out September 16, 2014, from Klayton’s (Celldweller) label FiXT, ‘End of an Empire (Chapter 01: Time)‘ features 5 new, original tracks along with remixes from Breathe Carolina, Comaduster, KJ Sawka and OCTiV. Get the single immediately when you pre-order from FiXT or iTunes or stream the track on YouTube & Spotify. Featuring monolithic vocal tracks of epic scope, this release highlights Klayton’s unique fusion of infectious electronic music with aggressive rock & roll the way only Celldweller can – by blurring the lines between organic and synthetic. The title track “End of an Empire” takes listeners on a 7.5 minute dichotic journey of metal-infused drum & bass blasts, and a contrasting mix of lush vocal hooks and aggressive screams. Klayton is Celldweller. Personifying the sound of the iPod generation, he creates a hybrid fusion of digital and organic elements: intricately designed soundscapes constructed from Dubstep, Drum & Bass and Electro, woven together with aggressive Rock/Metal and Orchestral elements. Celldweller ignores genre boundaries and creates a pioneering vision of the future of electronic music. CRIMSON SHADOWS, the Epic Metallers from the depths of Canada are set to release the brand new album Kings Among Men September 9th USA/CAN via Napalm Records. The album is available for pre-order on Amazon or iTunes. The band has completed work on a video for the song “Heroes Among Us”, and today the video is receiving its exclusive premiere courtesy of Metal Injection. Check it out HERE. Kings Among Men is available for streaming HERE. The Wacken Metal Battle Winners 2013 are hitting the road this fall! Make sure to check out their upcoming tour dates! The band is currently in the middle of an indiegogo crowd funding campaign for their European tour. Help out the band and receive some cool perks HERE. The new studio album Pandemonium will be released on November 3rd in the UK & November 4th US/CAN via Napalm Records and shows that fatigue is a foreign word for them. Front man Max Cavalera rushes with bellow of rage into the fray, lets his brother drum coarsest grooves and puts his finger into the open wound. Today the artwork and track listing for Pandemonium have been revealed.